Reading: Barbara Kingsolver’s Flight Behavior. Eating: Melty squares of Lindt chocolate, 70%. I recently bought a bar that was 85%. It’s going to be too strong, isn’t it? Thinking about: Adopting a dog. I do this a few times each year, where I get really serious about adopting a dog. I’m at a place in my life where I can finally spend an ethical amount of time, energy, and money on a dog. Plus, I’ve been writing a lot lately, and writers need dogs don’t they? 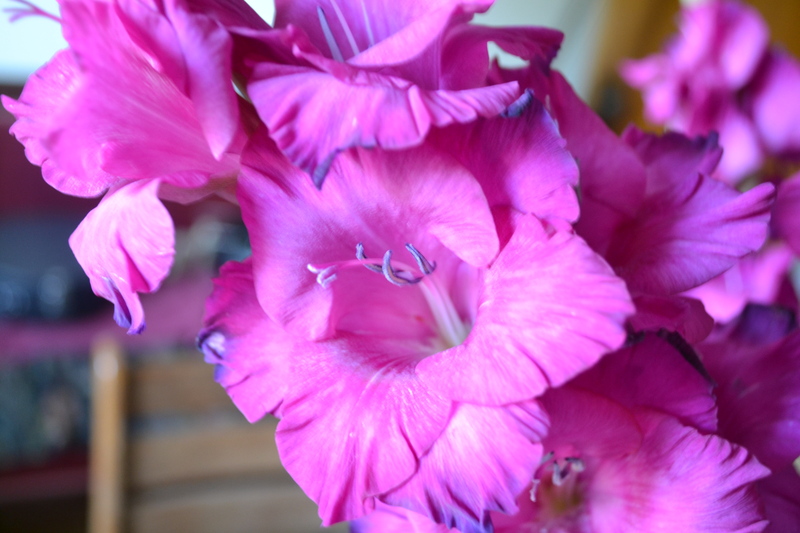 I’m enjoying bouquets of gladiolus. Enjoying: My patio garden and small attempts at landscaping (though my space is very limited). I’ve created this back patio area, fully decked out with a couch, where I can read for hours. Watching: I’ve been watching old episodes of Archer. I bought Netflix back May to watch the new season of Arrested Development. I keep forgetting (on purpose) to cancel it. Loving: Having some time to myself. This summer has been really hectic, and most of it has either been work, or has felt like work. I’ve taken some time for myself this last week, and it feels really good. This entry was posted in books, garden, life, love, work, writing and tagged arrested development, barbara kingsolver, currently, flight behavior, patio garden on August 2, 2013 by sherewin.